These menus are for inspiration and hope to give you a better idea of what kind of catering we are capable of providing. We can fully customize these options to better suite your event budget and needs. assorted nuts, speciality crackers and breads garnished with fresh berries and grape clusters. Yakitori, soaked with Sake, mirin, garlic, soy sauce, and ginger. A beautiful array of seasonal fruit. Fresh cut carrots, celery, broccoli, pickled green beans or asparagus, baby tomato medley served alongside creamy garlic, buttermilk ranch and creamy balsamic dipping sauces. Mini Baked Potato, baby red potato filled with bacon, cream cheese, sour cream and cheddar cheese garnished with fresh chive. Beef Tenderloin, seared and served with a peppercorn cream sauce in a wave spoon. Shrimp Canapé, fresh cucumber rounds topped with a chili-ginger seared shrimp. 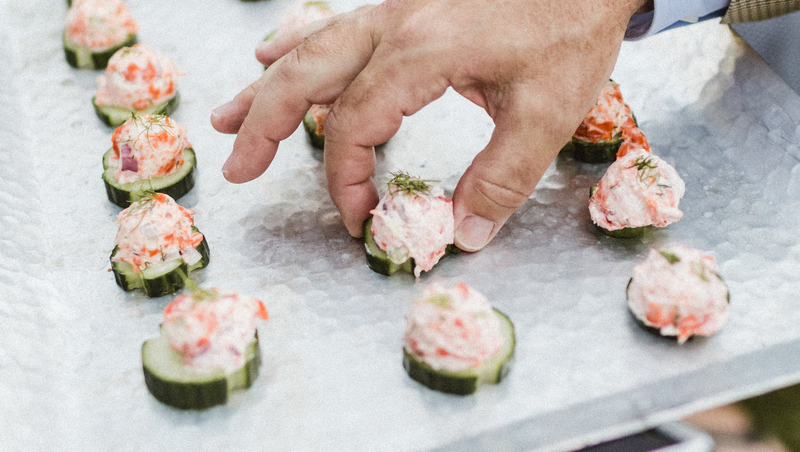 Salmon Canapé, fresh cucumber rounds topped with dill-cream cheese and smoked salmon. Stuffed Mushrooms, filled with Italian cheeses and spinach simmered in a garlic butter broth. Ahi Tuna, seared rare sesame crusted Ahi Tuna served on a crunchy wonton round topped with spicy aioli, togarashi, and micro greens. Mini Pita, stuffed with your choice of Caprese salad, chicken salad or lamb gyro. Chicken Salad Crostini, slow roasted chicken breast salad topped with fresh avocado. Shrimp Crostini, shrimp, Monterey jack, green chili and cream cheese spread atop a crostini. Bruschetta, crostini topped with a tomato-basil topping garnished with a balsamic glaze reduction. Pesto Gnocchi or Penne Pasta, simmered in a light cream sauce, finished with organic baby spinach, cherry tomato and parmesan cheese. Balsamic Marinated Vegetables, sautéed in olive oil finished with butter. Caesar Salad, crisp romaine, toasted pine nuts, imported parmesan cheese, garlic croutons tossed in our house-made Caesar dressing. Roulade, stuffed airline chicken breast filled with prosciutto, basil pesto cream cheese and topped with a light cream sauce. Haricots verts, tender French green beans sautéed with garlic, finished with butter. All Seasons Wedding Salad, local greens, baby organic spinach, dried cranberries, feta cheese, toasted walnuts, herbed croutons, huckleberry or raspberry vinaigrette. Autumn, grilled pear or apples, artisan romaine wedge, gorgonzola, candied walnut, roasted cherry tomato, thick cut hickory smoked bacon drizzled with a red wine vinaigrette. Fresh Baked Dinner rolls with chilled butter chips. Add Grilled Tri Tip Steak carving station to this menu for an additional charge. Tri Tip Steak, rubbed with spices and marinated in garlic. Grilled BBQ airline chicken Breast brined, grilled and brushed with a Huckleberry BBQ Sauce. Baby Red Potato Salad, diced red onions and celery, hard boiled eggs, in our house-made potato salad dressing. Fresh Grilled Corn on the Cob, served with butter and Jonnys seasoning. Strawberry & Spinach salad, tossed with feta, candied walnuts, croutons and a balsamic raspberry vinaigrette. Grand Marnier Fruit Salad, assortment of melon balls and diced fruit tossed with Grand Marnier Liquor and fresh mint. Fresh Baked Dinner rolls served with a honey-cinnamon whipped butter. Add Cedar Plank Wild Copper River Salmon to this menu for an additional charge. Grilled Wild Alaskan Salmon, served with lemon-herb compound butter. Fresh Baked Assorted Dinner rolls with chilled butter chips. Enhance this menu by adding an Idaho Potato Martini Station for an additional charge. Looking to make your event a little more upscale? We can offer most of these entrees served table side or family style with uniformed wait staff. Grilled BBQ Chicken Breast or Thigh brushed with a Huckleberry BBQ Sauce. Roulade, rolled chicken breast filled with prosciutto, fontina and basil pesto topped with a light cream sauce. Grilled Wild Alaskan Salmon, flown in fresh 24 hours prior to your event. Served with lemon-herb compound butter. Cedar Plank Salmon, copper river wild alaskan salmon grilled on a cedar plank served with a side of huckleberry bbq glaze. Hazelnut Crusted Halibut, tender white fish crusted with toasted hazelnuts, baked and finished with a white wine, lemon, butter sauce. Blackened Salmon, rubbed with our special blend of cajun spices. Tri-Tip Steak, marinated in garlic, herbs and spices and grilled to perfection. Prime Rib, Horseradish and Garlic Crusted Prime Rib, served with Creamed Horseradish and Au Jus. Beer Braised Beef Short Ribs, boneless beef short rib, served with a sweet onion-beer reduction topped with crispy leeks. Beef Tenderloin served with a roasted garlic, Dijon and caramelized onion pesto. Tenderloin, marinated in garlic and olive oil finished with a Dijon cream sauce. Pork Loin, Rubbed with rosemary and garlic and wrapped with pancetta. Grilled Chop, bone in-center cut pork chop marinated in house-made basil pesto. The perfect accompaniment to one of our delicious entrees. Baby red potatoes, celery, red onion, hard boiled egg in our scratch dressing. Assorted melons, strawberries, blackberries, pineapple and grapes dressed with Grand Marnier Liqueur and fresh mint. Mini penne salad, toasted pine nuts, imported parmesan cheese and roasted chicken tossed with our house made Caesar. Strawberry & Feta, baby organic spinach, feta cheese, toasted walnuts tossed with a strawberry balsamic vinaigrette. Potatoes Au Gratin, chopped Idaho russet potato, cream cheese, sour cream and cheddar cheese baked to a golden brown perfection. Rice Pilaf, a medley of wild rice simmered with butter and herbs. Gourmet Slow Roasted Beans, baked beans sautéed onions, dijon mustard, apple cider vinegar, brown sugar and bbq sauce. Gourmet Mac N Cheese, Tillamook cheese, elbow pasta, panko topping baked to perfection. Roasted Baby Red Potatoes, slow cooked caramelized onions and baby red potato bathed in olive oil and heavily seasoned roasted until fork tender. Parsnip-Potato Puree, velvety parsnips and yukon gold potatoes finished with butter and cream. Mangia Catering has put together several live action stations and late night snacks that are a fun and interactive style of catering that your guests will be sure to enjoy. We have steered cleared of the traditional chaffer dish buffet line and brought you some fresh ideas from the most current trends of the industry. These stations can be added ala carte to a buffet line or be different and offer several stations as a full meal. We take care of all the calculations of equipment, food and staff. You can just sit back and relax, while watching your food being made right in front of you and all of your guests. For a late night snack, or a fun cocktail hour experience, try out our new wood fired pizza oven. Whether you have our pizza chef’s toss and make your pizza, or have your guests top their favorite pie, you wont be dissapointned in our gourmet, Neapolitan style pizza. We bring the deep fryer and all the fixings for this gourmet fry station. Choose natural, shoe string, steak cut, or crosscut French fries with an assortment of toppings like fresh garlic, parmesan-Romano cheese, chili cheese or spicy paprika. You can’t offer fries without something to dip them in, so choose from our house made ketchup, buttermilk ranch, creamy garlic or Sriracha dipping sauces. Guests are greeted with an attendant ready to mortar and pestle some guacamole with your guest’s favorite add’ins of fresh jalapeño, lime, garlic, onions, salsa, cheese, olives and more. Served with organic white tortilla chips. An assortment of cashews, almonds, peanuts, spicy Asian brittle, buttery popcorn, chocolate and caramel dipped pretzel sticks. Just like the fair, these hand spun fried cakes are delicious when topped with fresh strawberries and whipped cream or drizzled with chocolate sauce and confectionary sugar. Guests will have the hard decision of choosing between Buttery Whipped Yukon Gold and Chunky Roasted Garlic Potatoes piped into a martini glass, topped with all their favorite toppings of fresh chives, scallions, sharp Tillamook cheddar cheese, diced bacon, gorgonzola, tomatoes, sour cream, sliced mushrooms, sautéed baby spinach and herb brown gravy, country gravy, cheese sauce and melted butter. Small heat elements placed around real charcoal briquettes where guests can roast their marshmallows and sandwich them in between chocolate dipped graham crackers. Fresh lemons pressed right in front of the guests, to order, mixed with sugar water. Guests can choose to flavor their lemonade with fresh fruit puree of strawberries, watermelon, huckleberries or raspberries. 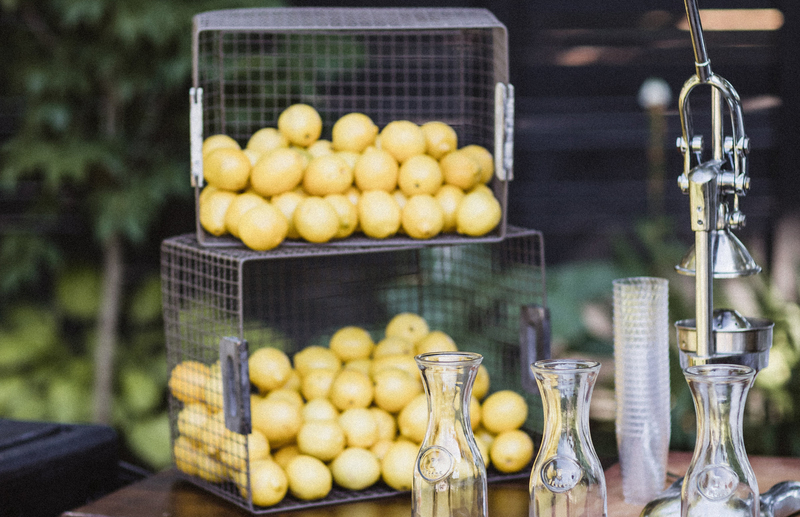 Your guests will feel like they are drinking from a lemonade stand at the fair. Popped On-Site corn kernels served with a great selection of toppings and seasonings. 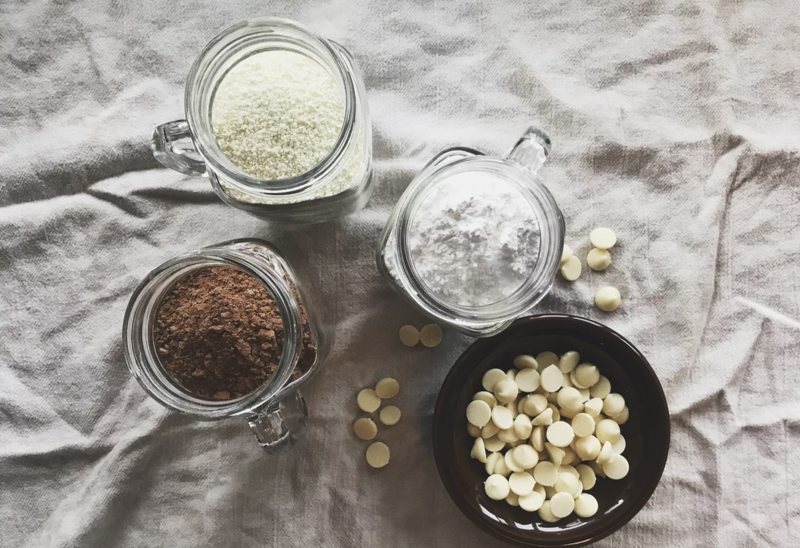 We bring the ice cream party to you and your guests with an assortment of locally made nitrogen infused gourmet ice cream. Guests can choose fresh made waffle bowls, cones or cups. For an extra fun and yummy option turn your ice cream into sundaes with assorted toppings. Whether its a bountiful display of cheese and seasonal fruit or a more upscale small bite we have many options to choose from to complete your menu. 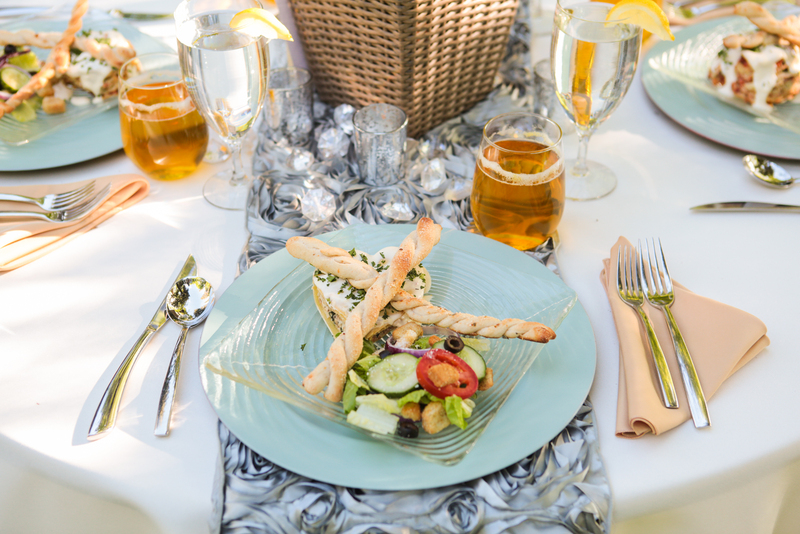 Some guests like serve just Hors d’ Oeuvres so we always suggest to plan on 7-10 items to substitute for a full meal. Gorgonzola Beef Satay, grilled beef tenderloin served with a gorgonzola dipping sauce. 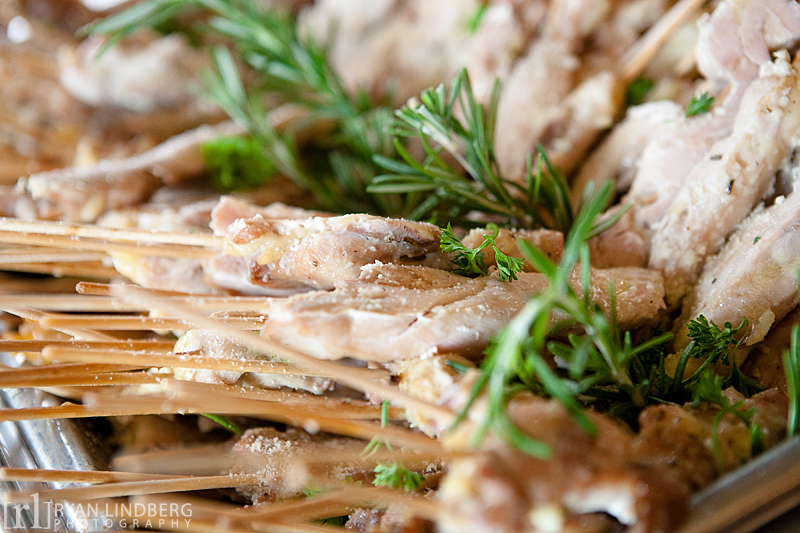 Rosemary & Garlic Chicken Satay, marinated and grilled. Thai Peanut Chicken Satay, grilled and finished with a house made Thai peanut sauce. Balsamic Glazed Beef Satay, beef tenderloin seasoned and grilled finished with a balsamic reduction. Bacon Wrapped Lollipop, large prawn wrapped with thick cut applewood smoked bacon. Lamb Lollipop, New Zealand lamb rubbed with a mint pesto. Caprese Lollipop, grape tomato, basil and fresh mozzarella. Gorgonzola Crostini, seared garlic greens, creamy gorgonzola, toasted pinenut and golden raisins. Black Bean Crostini, black beans pureed with onions, jalapeños, garlic and southwestern herbs and spices, garnished with fresh avocado. Organic, fresh, blanched, and pickled locally and regionally grown veggies served with your choice of creamy garlic, creamy balsamic and Buttermilk ranch dipping sauces. assorted nuts, dried fruit, speciality crackers and breads garnished with fresh berries and grape clusters. Marinated Mozzarella, provolone, parmesan wheel, salami, grilled eggplant, grilled zucchini, assorted olives roasted peppers, marinated artichoke hearts, roasted elephant garlic, grissini, toasted ciabatta, balsamic vinegar and extra virgin olive oil. Grilled Pita Points, Hummus & Marinaded Feta, Olive Tapendae, Romesco Sauce, accompanied with Greek Peppers, Marinated Artichoke Hearts and assorted olives. A display of “little toasts” accompanied with Bruschetta, Basil Pesto, Sun-dried Tomato Pesto and a Goat Cheese Torte. Mini croissant sandwiches with your choice of Turkey & Havarti, Roast Beef & Cheddar or Ham & Swiss, garnished with a mini pickle and cherry tomato. slow roasted pulled pork topped with coleslaw and pickles. Only the best hotdog, Nathan’s! Served on a mini slider hot dog bun topped with fresh onion, relish and stone ground mustard. Bacon Cups, small bite sized cups made of bacon filled with gourmet baked beans. Mini Mahi Mahi Tacos, warm corn tortilla, mahi mahi, lime, cabbage and pico. 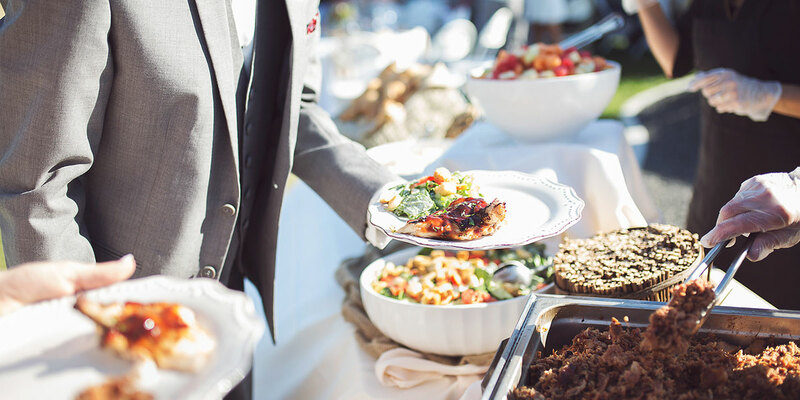 Mangia Catering offers seasonally inspired wood fired pizzas for your wedding, special event, work lunch, birthday party or family gathering. Pizzas are fired onsite in our speciality made mobile pizza oven. We use locally grown wheat from the Washington Palouse for our pizza dough. 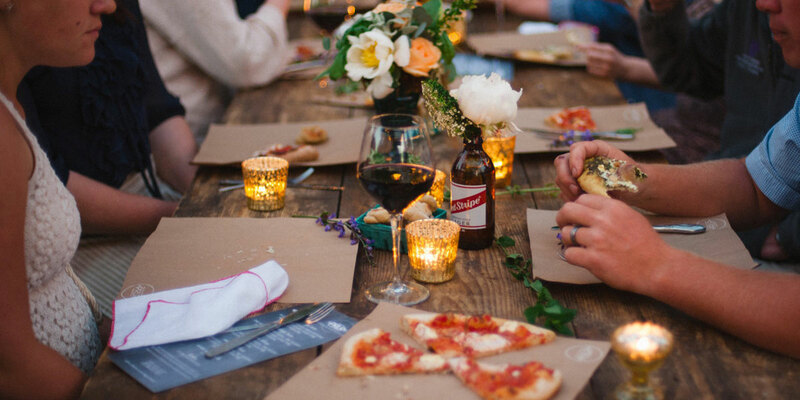 We bring the pizzeria to your event! Our pizza oven is fired with apple wood, reaching up to 900 degrees, baking pizza in just 2-3 minutes. We have an assortment of packages or you can create your own pizzas with the options below. Pepperoni Blast-because who doesn’t like deep fried pepperoni? Chevre-fancy name for funny cheese made out of goats milk. Farmer’s Market-whats better then farm to table? Thai-big bold flavors. our peanut sauce rocks. Hail Caesar!-hot pizza topped with cold salad? try it, you wont be disappointed. Idaho-c’mon, we have to give a nod to our motherland! 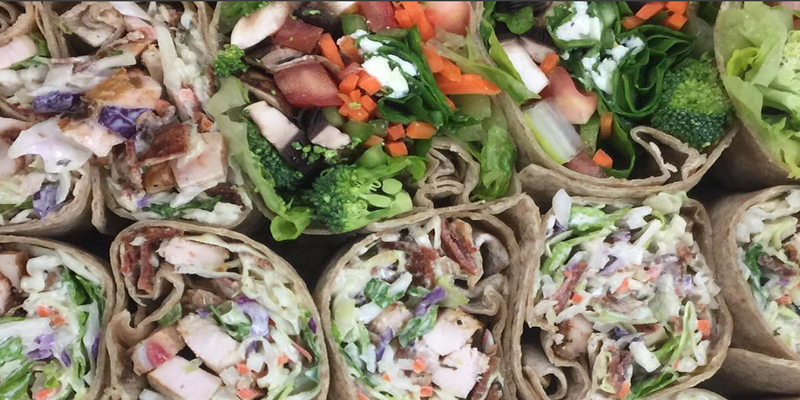 Our express service provides delicious, mouth-watering food for your event, without the pomp and circumstance of full service catering. Great for office luncheons and casual gatherings! Slow roasted pulled pork served on a kaiser roll topped with apple cider slaw. Tender potato, diced celery, red onion and hard boiled egg mixed in our house-made dressing. Slow roasted beans, simmered white onions, bacon, dijon, brown sugar and apple cider slaw. Brined and grilled chicken leg, thighs and breast. Fresh baked roll served with a whipped honey-cinnamon butter. Choose from Penne, Bowtie or Spaghetti, accompanied with scratch-made Parmesan Alfredo and Pomodoro Marinara sauces. Fresh chopped romaine, house made caesar dressing tossed with herb croutons and imported parmesan cheese. FIlled with meat ragu, creamy white sauce and our house-made cheese blend. Topped with melted mozzarella. Hearty meat sauce (beef and pork) tossed with Ziti finished in the oven with our house blend of cheese and Italian Herbs. Oven roasted turkey breast served with scratch-made gravy. House-made with diced bread and slow-roasted onions, carrots, and celery. Organic white corn steamed and finished with butter. Chopped romaine, diced tomato, cucumber, red onion, garlic-herb crouton and cheese. Tender chicken simmered in dijon and apple cider vinegar, garnished with roasted pecans. Finished with brown sugar-honey glaze. Elbow pasta simmered in a creamy cheese sauce. Served on a fresh baked croissant sandwich or thick sliced whole wheat bread, topped with fresh veggies. Served with chef’s choice pasta salad, kettle chips, pickle spear, and fresh baked goodie. Shredded pork or shredded chicken, served with tortilla chips and warm flour tortillas, roasted black beans and Mexican rice. Served with all the toppings: cheese, sour cream, salsa, lettuce, tomato, pico di gallo. Fresh ground beef or chicken, served with tortilla chips and warm flour tortillas, roasted black beans and Mexican rice. Filled with your choice of cheese, shredded pork, beef or chicken, rolled in our house made green sauce, topped with Monterey jack cheese. Served with tortilla chips, salsa, sour cream, roasted black beans and Mexican rice. Our team of chefs have created memorable holiday menus that will leave your guests with the best impression and delighted taste buds. All of our holiday experiences include festive non alcoholic beverages and a limited bar with beer and wine. Choose from one of our exciting and festively decorated venues, like the White House, The Jacklin Center or Shrine Club. Or, choose to host your party at your own location! Either way, we have all the details covered. Our event specialist can create festive holiday parties that all of your guests will enjoy! Beef Tenderloin, seared and served with a peppercorn cream sauce in a wave spoon. Chicken Salad Crostini, slow roasted chicken breast salad topped with fresh avocado. Balsamic Glaze Beef Satay, beef tenderloin seasoned and grilled finished with a balsamic reduction. Gorgonzola Beef Satay, grilled beef tenderloin served with a gorgonzola dipping sauce. Rosemary & Garlic Chicken Satay, marinated and grilled. Thai Peanut Chicken Satay, grilled and finished with a house made Thai peanut sauce. Caprese Lollipop, grape tomato, basil and fresh mozzarella. *Choose up to 3 hors d’ oeuvres. LIMITED TO ONE SEAFOOD SELECTION. Pear & Walnut Salad, Macintosh pears, field greens, candied walnuts. Blood Orange & Radicchio, with toasted hazelnuts, shaved imported Parmesan tossed in a blood orange vinaigrette. Caesar Salad, crisp romaine, garlic croutons, toasted pine nuts, imported Parmesan cheese tossed in our house made Caesar dressing. Herb Roasted Corn on the Cob, mini cobs steamed and served with butter chips and Jonnys seasoning. French Green Beans, tender green beans sautéed in olive oil and garlic finished with garlic. Roasted Baby Carrots, finished with a honey-lemon glaze. Roasted Assorted Mushrooms, finished with shallots and white wine. English Peas, sautéed pearl onions, butter. Veggie Medley, zucchini, squash, red onion, asparagus and mixed bell peppers marinated in balsamic vinegar and extra virgin olive oil. Roasted Baby Red Potatoes, slow roasted with white onions in olive oil, seasoned roasted until fork tender. Whipped Yukon Potatoes, golden potatoes whipped with cream and butter. Roasted Garlic Mashed, hearty mashed red potatoes, butter and cream. Wild Rice Pilaf, onions, carrots, celery, butter and thyme. Roasted Fingerling Potatoes, a roasted assortment of baby red, gold and purple potato. Gourmet Mac n’ Cheese, elbow pasta, Cougar Gold cheddar melted into a creamy cheese sauce. Whipped Sweet Potato, mixed with condensed milk, maple syrup, brown sugar, topped with candied pecans. Roasted Prime Rib of Beef, horseradish and salt crusted served with creamed horseradish and au jus, carved to order. Boneless Roasted Top Sirloin, rubbed with garlic and spices, slow roasted, carved to order. Turkey Breast, slow roasted served with herbed scratch gravy and stuffing. Baked Chicken Roulade, chicken breast filled with organic baby spinach, pancetta and fontina cheese finished with a dijon sauce. Chicken Purse, folded chicken breast filled with bacon and mozzarella finished with a dijon sauce. Herb Grilled Chicken Breast marinated in rosemary, thyme, oregano, garlic, lemon and olive oil. Tri Tip Steak, marinated in garlic, herbs and spices. Baked Salmon topped with a Lemon Caper Cream Sauce.